September 8 is World Physical Therapy Day. The goal of this day is to raise awareness about the crucial contribution physical therapy has in making people well, mobile and independent. 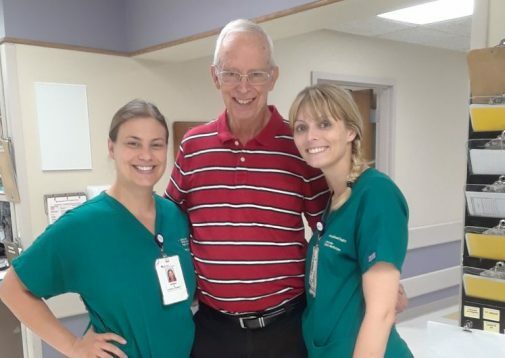 In honor of this day, Sarah Glowacki, a physical therapist at Advocate Christ Medical Center in Oak Lawn, Ill., and her patient, Lee Dobbins, share their inspiring story. Newly retired and preparing to run the Race to Wrigley with his two daughters, Lee Dobbins was at the height of his retirement and enjoying every moment of it. However, in April 2016, his life would be significantly altered forever. Lee was in his bathroom at home and suddenly passed out. As he fell to the floor, he hit his head on the wall, leaving a hole, and he was left unconscious and unable to move his body. He was rushed to his local hospital, where it was determined he needed a higher level of skilled trauma care and was transferred to Advocate Christ. He suffered a severe spinal cord injury from his fall. Lee underwent a five-hour surgery to repair his spine, and it was successful. After regaining consciousness following the surgery, he had limited mobility in his hands, arms and legs from the damage of the fall and needed extensive physical therapy. When Lee woke up from surgery, he was confused and had no recollection of his fall. A week after surgery, Lee started physical therapy with Sarah and her team, but coming to grips with this diagnosis and what the journey ahead was going to be like would be an obstacle for him to overcome. When Lee left the hospital after six weeks of therapy, he was able to walk, get in and out of bed and even use his iPad on his own. His condition improved as he continued therapy for several months after he was discharged from the hospital. To this day, Lee still visits his physical therapy team and can’t thank them enough for believing in him. Now, two years later, Lee is doing more than he dreamed he could. He is driving, grocery shopping, going to sporting events and helping take care of his wife. Lee never gave up his goal of completing the Race to Wrigley with his daughters. In May, Lee finally made this dream a reality, and he isn’t stopping there. On September 9, Lee will be participating in his second race since his accident, the Brookfield ZooRunRun.